On Sunday night, I watched bold young men in a make shift arena face off crazed multi-ton sharp horned bulls and barely evade rapid, unpredictable, potentially fatal contact. Adrenaline poured through my veins as I sat and watched, unable to look and unable to look away. I literally had to go home and take Advil and use my last bag of herbal tea just to get through the after shock. We had ventured off to Los Ranchos, a small town outside of everywhere to a Fiesta that rivals any county fair in the U.S. but is very different. 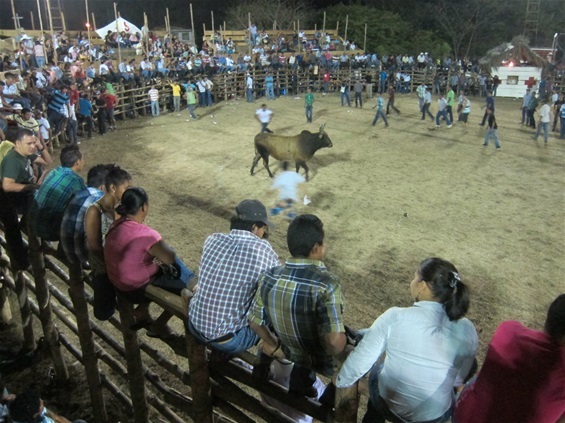 The main attraction is the “bull fight,” but rest assured that in Costa Rica, it is illegal to kill a bull. Instead, the bull is released into a small arena full of young men. Many others, including a few women, sit on the edge of the surrounding fence, their legs dangling into the arena, while the bull looks this way and that, selecting his next victim, and then charges. The crowd scatters, the audience gasps, and the bull starts again. After a time, 3 highly skilled fearless men on horseback enter the arena and with the precision of a pediatric orthodontist, lasso the bull horns and in a choreography of rope work and horsemanship, they guide the enraged bull into a slender closet and slam the door shut behind him. We spent the evening there and I would admit that my visceral reaction to the spectacle seemed singular. No one else emitted the screaming that I involuntarily subjected on the crowd, and later when we were home, I saw in one of Gary’s videos that a young lady sitting on the fence, a lady whose legs were dangled precariously close to the raging bull and whose death or dismemberment appeared to be imminent, was actually texting instead of running for her life.